Which means my tastes vary wildly and can veer unexpectedly into interesting areas. And I enjoy the side trips and discoveries especially with the aid of modern search engines. Bustling algorithms comb my search histories and spew forth a cacophony of oddness and relevant suggestions that only drive me further into an intense appreciation of human creativity. 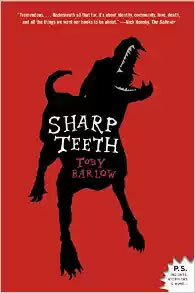 Which is how I found Sharp Teeth by Toby Barlow. It came recommended from a couple of sites, no doubt filtered down to me from a plethora of searches for latest Patricia Briggs or Bernard Cornwell books and I would have overlooked it but something in the description caught my eye. It's written in free verse. Poetry. Yes, it's a story of werewolves in modern L.A. but it's delivered in literary chunks of eye kicks that skimp on detail but deliver on emotional touch points. You are carried along with the rhythm of verse and the narrative of street level characters that you come to fear, respect and care about. It shouldn't work. It defies convention on the conceptual level. There is not a creative writing course in the world that would approve of this method. This is a rolling story with wolves and blood and carnage and delivered with phrasing that would fit right into a poetry slam. I will say that it takes a minute to warm up to the delivery. It's almost like Shakespeare. You have to read a few pages and maybe read them again but then the language centers in your brain relax and the words flow like water into a thirsty mind. Pictures form and the world disappears as you sink into the story until you look up and it's an hour or more later. I was beginning to wonder if immersive reading experiences still existed. I enjoy reading. But most of the best books are very choreographed and almost stilted. Modern writing went through a phase of self imposed rule mongering that frankly cut hard into the creativity. Rules and guidelines have their place of course but I've seen critics shut books because the author violated the "show, don't tell" rule or the "never use passive voice" guideline or the "past tense is the only tense" commandment even if it was done with intent and creatively. But then came the Internet and now the rules lawyers are sweating and gatekeepers are wondering if they still have a job and any creative can put their product out there if they have the balls. It is a fascinating time to be alive. But back to our book: There is also a lot going on in the story and the scenes are sometimes short and shifting and it gets tricky to keep track of all the threads. I considered it part of the fun and was fine with rereading a passage that dipped a bit far in to the stream of consciousness. But I could see how that would annoy some. But this book isn't for everyone even though I think anyone who has any interest in the written word should give it a try. Also keep in mind that it's about werewolves. And not the happy, fluffy kind that litter urban fantasy. And the horror is there along with some blood and guts (tastefully done, mind you, no pun intended). Expect a twists and surprises and maybe a cliche or two but mostly expect a different literary experience. And, yes, it really shouldn't work. But I'm really glad it does.